Paulist Fr. Rich Andre preached this homily on Palm Sunday (Year C) on April 14, 2019, at St. Paul the Apostle Parish in Horseshoe Bay, TX. The homily is based on the day’s readings: Luke 19:28-40; Isaiah 50:4-7; Psalm 22; Philippians 2:6-11; and Luke 22:14 – 23:56. Only one part of Luke’s Palm Sunday account is unique from the other three gospels: Jesus declares that the stones will cry out if the people are silent. I’ve traveled to the Holy Land two times, and I will be leading a pilgrimage there again next February. I have now witnessed the testimony of the stones of the Holy Land. I have stood where the angel Gabriel appeared to Mary. I have touched the spot where Jesus Christ was born. I’ve celebrated Mass at the site of the Transfiguration, and I’ve seen where Jesus is said to have mounted the colt on Palm Sunday. In Nazareth, Bethlehem, Mt. Tabor, and Bethphage, the stones themselves testify to the glory of God. For nearly two thousand years, pilgrims have flocked to touch these stones and hear their Spirit-filled songs, songs that reverberate in our souls for the rest of our days! Today, we re-enact the joyful procession of the first Palm Sunday when the people of Jerusalem hailed Jesus as the Messiah. But for us, that joy can feel forced: we know that the people thought that the Messiah would be a military conqueror who would defeat the Roman occupation. That did not happen. However, Jesus did fulfill another belief about the Messiah that was predicted by the Jewish midrash a thousand years before Jesus’ birth. The midrash predicts that the Messiah will appear on the Mount of Olives and will head, as Jesus did, towards the Temple Mount. Dear brothers and sisters, like the crowds in Jerusalem, let us go forth, proclaiming that we are ready to follow Jesus Christ! Now the mood of our Mass changes drastically. For the rest of this Mass, we journey with Jesus as he became our king through his humble faithfulness to the Father’s will. As we listen again to the story of Christ’s passion and death, how are our life experiences like Jesus’? How are they different? How are we similar to the descriptions of Jesus in our Isaiah reading and our Philippians reading? To me, the Passion definitively proves that God is not remote. God understands the human condition. Jesus Christ emptied himself of godliness. He experienced the full range of human emotions. He suffered and died in the midst of the complexities of social sin. Let’s admit it: Calvary plays out continually all around the world, nearly two thousand years later, day after day. Politics continue to make for strange bedfellows and frequent betrayals. People continue to be wrongly convicted for crimes they did not commit. Violence is everywhere. Christians, Muslims, Jews, Hindus, and Buddhists are persecuted – even killed – for their religious beliefs today. It’s doubtful that any of us here in Horseshoe Bay will suffer the horrific things that so many of our brothers and sisters suffer around the world. It’s even harder for us to compare our own sufferings to those of Jesus. But yet, Palm Sunday invites us to find a visceral, personal connection to the crucifixion of our Lord and Savior, Jesus Christ. 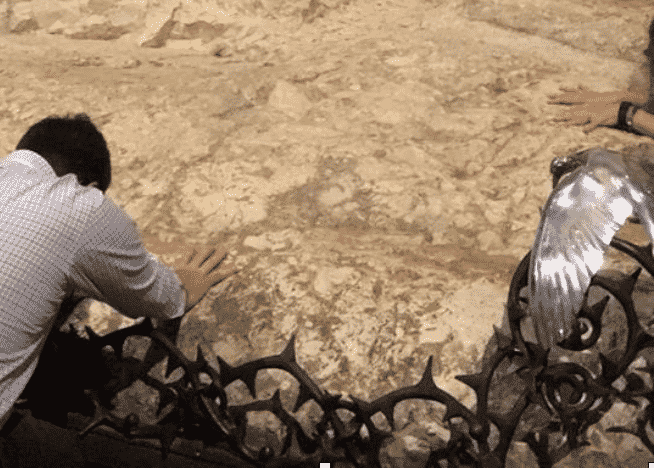 One personal connection I can make is this: I have touched the stones that continue to witness to Jesus’ passion and death. I’ve celebrated Mass at the rock where Jesus was betrayed in the Garden of Gethsemane, as I’ve prayed for those people in my life that I have let down. I’ve prayed in the pit under Caiaphas’ house where Jesus was imprisoned, as I’ve prayed for the people around the world today who are wrongly imprisoned and tortured. I’ve reverenced the rock where Jesus died. There, I’ve prayed for all the people around the world on death row. Surely, we can more easily find bonds with the unique secondary characters in Luke’s account of the Passion. Together, these characters represent a host of ways that we can interact with those who are suffering. King Herod was given the perfect opportunity to intervene on Jesus’ behalf. If Jesus had performed a few minor party miracles to entertain the king and his entourage, Herod may have pitied a man whose suffering did not affect him. The soldiers and the unrepentant thief had no power to alleviate Jesus’ pain, but they chose to intensify Jesus’ suffering by mocking him and dressing him in regal clothing. The women could not lessen Jesus’ suffering either, but rather than running away from the bloodshed, they trod with Jesus and grieved his fate. The repentant thief, hanging next to Jesus, made the extraordinary effort to protest the web of sin that entrapped Jesus. Through his dying gasps for air, he threw his lot in with this stranger he somehow knew to be innocent. Every day, people walk the road to Calvary. And our instincts urge us to act with a combination of the whim of Herod, the self-preservation of the soldiers, the grief of the women, and the compassion of the repentant thief. Compassion. That is the gift we are called to give. To be with those who are suffering. The Latin word is misericordia, to suffer with the same heart. We usually translate misericordia into English as mercy. made Peter weep after his betrayal, and assured Paradise to the repentant thief. you who live and reign with the Father and the Holy Spirit for ever and ever. Amen.